6.44 points at 16 votes (rank 533). Deep under the ocean's waves, not far from Neptune's Palace lives the evil sea snake, whose only pastime seems to be the kidnapping of the Neptune's daughters. As unusual as this passion might seem at the beginning, (why should a snake kidnap someone), so simple is the background: our evil sea snake is from time to time bothered by a real cruel ravenous appetite for monster crabs. As it is utterly intelligent and devious, it has recognized that each time it kidnaps a number of Neptune's daughters, he will go out to feed it with exactly this delicacy so it releases them again. 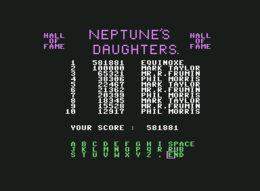 And it has also noticed that Neptune has not an endless number of daughters, therefore it sets free one of the daughters after a certain number of received monster crabs... it just can knidnap it again next time. . . The single game sections are each on one screen, which must be crossed to get to the next one. At the lower part of the screen there is a display (bar) which shows the oxygen that is left. 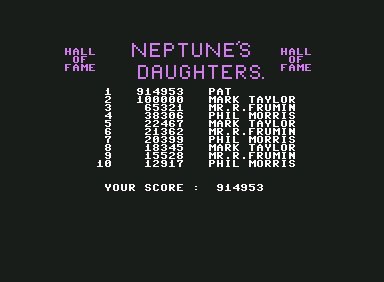 After rescueing all of Neptune's daughters, the game starts again with a higher difficulty grade. If you reach a corresponding score you can enter your name into the highscore list, which unfortunately is not saved on disk. ... another image from the game. 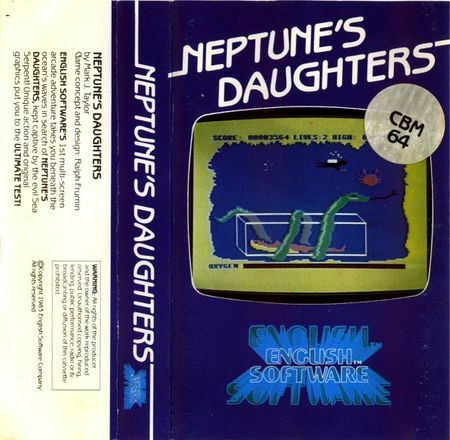 The player controls Neptune, who first has to make his way through the depths of the ocean and second has to catch crabs and bring them to the snake and third he has to show his daughter the way back. Water plants: They need to get destroyed to be able to pass. Squid: It follows Neptune and is immortal. But it can be kept at distance with a hit. Amoeba clusters: They set free oxygen after getting hit. This can be picked up. Monster crabs: They have to be killed first, then caught and then brought to the snake through the window (let them fall onto the snake's tongue). When the snake has received enough crabs it will release one of Neptune's daughters. They will now be shown the way back (happens automatically). Neptune follows the movements of the joystick. The fire button triggers the harpoon. When the snake has been rached, a caught crab is dropped with a press on the fire button (drop it on the tongue, the snake wants five crabs before it releases one of the daughters). Do not take too long and always have an eye on the oxygen supply. The squid can swim through the background and can by this get overseen fast. The seahorses next to the snake do not pose any threat. H.T.W: "A small but nice game. The difficulty grade is high, but after a few tries you will be "well-rehearsed". The graphics are okay and the "scrolling in" of the next level screens makes memories of long passed time come up again. If also the highscore list would be saveable . . .". Shakermaker303: "A nice game with entertainment value. The player figure can be well controlled and though there are rather few levels (please consider the year of release), it is every now and then a pleasure to play." 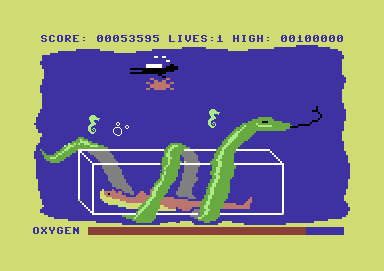 Equinoxe: "One of my first C64 games. At that time it was rather funny for some time and I spent some of my afternoons with feeding the snake instead of doing my homework. There was a real déjà-vu when I accidentally rediscovered this game here. I think I am going to test it again soon. 6 out of 10 points." This page was last modified on 12 August 2017, at 10:22.